A promising professor has absconded with university property – an ancient and mysterious silver tablet. Now, you’ve been hired to search her manor for clues to her whereabouts... all while treating the matter with the utmost discretion. But what darker secrets does the tablet hold, and why did Professor Wolcott cut off all communication with the outside world? 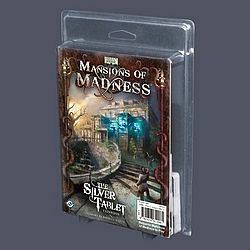 The Silver Tablet is a Print on Demand story expansion for Mansions of Madness! This gripping story tasks players with solving the horrifying mystery behind an ancient artifact... all while resisting its sinister powers.